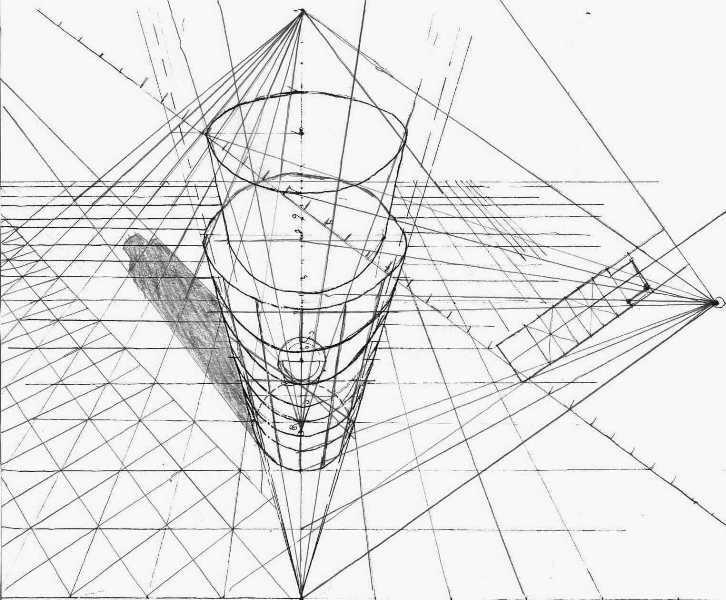 This is a scale point projection onto a plane, of the Leaning Tower of Pisa. It is on a checkerboard so you can tell that its actually leaning towards you. I had this really boring English class, I took this project on as a challenge. The drawing on left shows what perspective work went into the drawing on the right before I erased the extra lines. 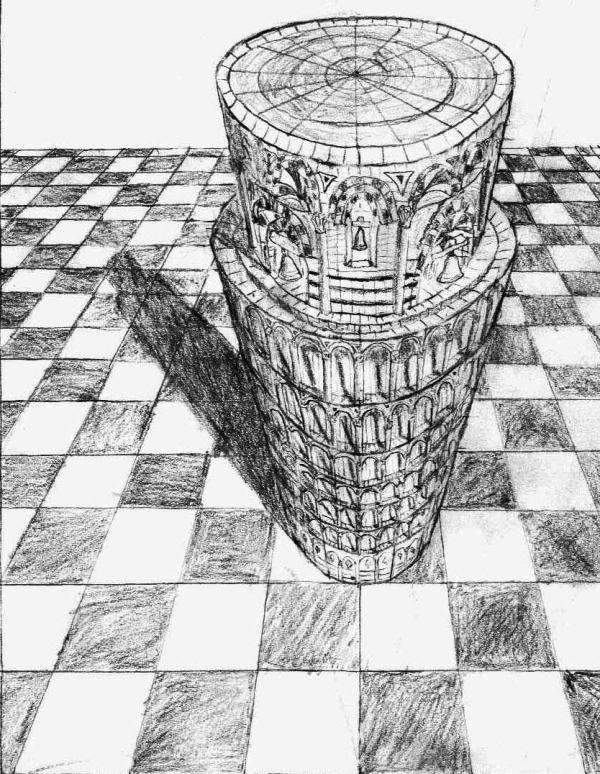 One of the cooler things about this drawing, although some people aren’t able to notice it, the tower is in fact leaning towards you relative to a horizontal, flat, ground (the leaning is not to scale, I quadrupled it so it would be easier to notice. Without the checkerboard, this effect would not have been possible. A challenge to anyone who thinks they know perspective: what is the small circle in the middle of the tower for? what went into placing that little circle so scale would be correct, scale was the hardest part of the whole thing. hint: the little dot below the circle represents an eye, same thing with the one on the far right. another needed hint: I had an extension piece of paper above the tower to make a larger surface, this was needed. Find the vanishing point of the ground. Find the vanishing point of those two lines, it is along a horizontal line to the left of the grounds vanishing point. Parallel lines have a vanishing POINT, a plane has a vanishing LINE! Since the shadow lies completely flat on the ground its vanishing point is on that line. At the tip of the shadow, the length of the thinner tip part is approximated. The length of the whole shadow is arbitrary because the sun could be anywhere. The curve at the top of the shadow is approximated. I didn’t draw the very tip of the top of tower. The curve of the bottom of the bells, was guessed (actually made a mistake: I did not think about the fact that even when the tower leans, the bells hang straight down). The actual lean of the tower is less then 5 degrees, I exaggerated its lean to about 20 degrees. Not including the neat lines on the bottom left, every single line in the right picture has a distinct purpose. I did not draw any just to make it look confusing or to look cool. There is only 1 vertical line in both these pictures. I could not find a single picture of the leaning tower of pisa from above, they were all from below. I had no idea whatsoever what to draw on the roof! so, I just made it up! now your wondering, "don't you need a ruler! ... and at least a compass for that little circle ... and what's with the pointy metal?" Fold along that line and you've got a nice sized ruler. To make the holes I used the pointy bit: I took a piece of lead out of the pencil, drew a circle with a radius of the distance between the two holes. The radius was very important for the scale to be correct. directly underneath your open eye (where a line from the eye is perpendicular to paper hits the paper at) the point where the thin part of the tower connects with the thick part. The shortest distance from your eye to the paper is exactly the distance (On the picture at right) from (the little circle with dot) on the right, directly to the vertical line in center of tower. Look around, the perspective will be like you are actually there. If you get it right, it should be apparent that the tower is tilting towards you. A warped reflection of a bus in a store window. This is really the way busses look when they are reflected in large windows. Windows are never perfect and larger ones tend to have larger imperfections. 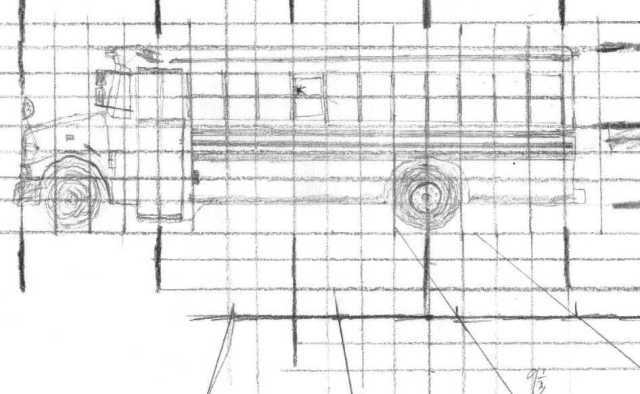 To draw it, I first drew a bus onto a grid (below). 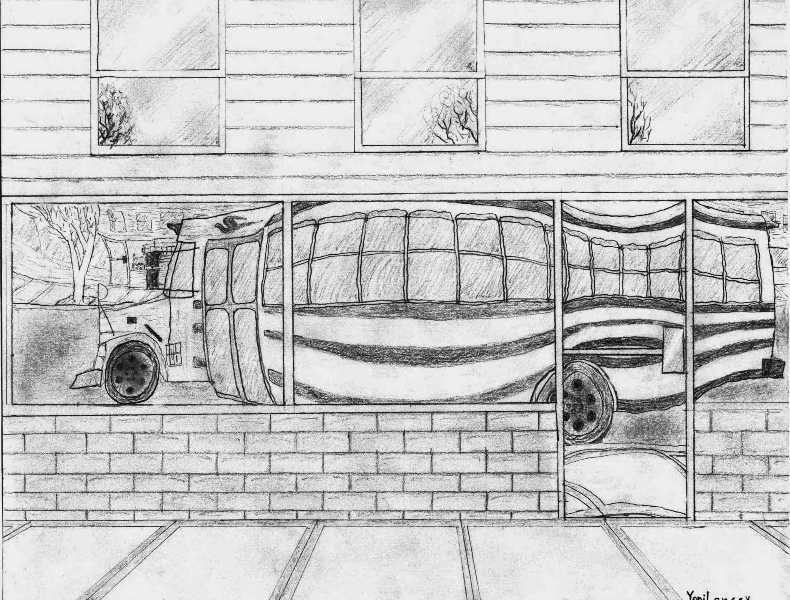 Then I drew a warped grid onto the windows, then copy-warped the bus square by square onto the warped grid.